Posted by Jenny in military history, Uncategorized, World War One. Victor Franke, commander of German forces and the foe in "German West"
This is the fifth part of a series that starts here and alternates with other posts. 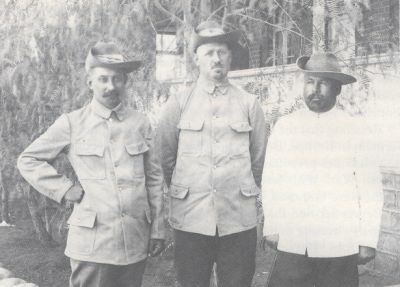 Reitz never saw combat in “German West.” His role was to establish contact between different parts of the South African army across hundred miles of arid, uninhabited country. It’s worth pausing for a moment to consider the communications problem. In this case we have to put aside not only modern ideas of electronic communication based on satellites or towers, or the not-so-modern concept of the telephone, but even the 19th century invention of the telegraph. 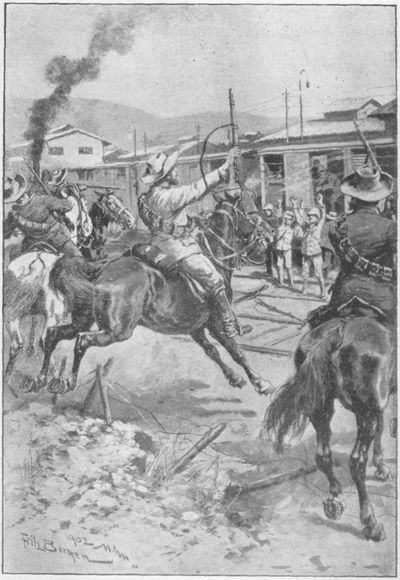 With long sections of telegraph lines destroyed by the Germans, Reitz established contact by riding for days in a given direction until he came across someone he could ask if they happened to have seen a large body of South African troops. He had done similiar work for Jan Smuts 1901-1902 in the Karoo. In December 1914, at the close of the Maritz Rebellion, Reitz was to join Smuts’ staff near Luderitzbucht, one of two ports along the 900-mile coastline of “German West.” But first he had to spend a couple of months “clearing up his district” around Heilbron. What that really meant was chasing across the veld after a few die-hard rebels (most of whom he knew personally), persuading them one way or another to hand over their rifles and ushering the worst troublemakers into jail. Around March 1915, having completed this task, he embarked on a transport from Cape Town to Luderitzbucht. Smuts was in charge of the southern army (6,000 men in the field at that point), which was dealing with German forces in the part of the country closer to South Africa, while Louis Botha had the northern army (12,000 men), which was now heading inland from Walvis Bay to the capital city of Windhoek. (As during the 1914 rebellion, Botha was comfortably playing the dual role of prime minister and general engaged directly in combat.) 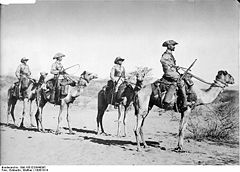 Two more South African columns were riding across large, bleak expanses of desert from the Orange River and the Kalahari to join the southern army. Against these four inexorably converging groups stood about 8,000 German troops in the field. 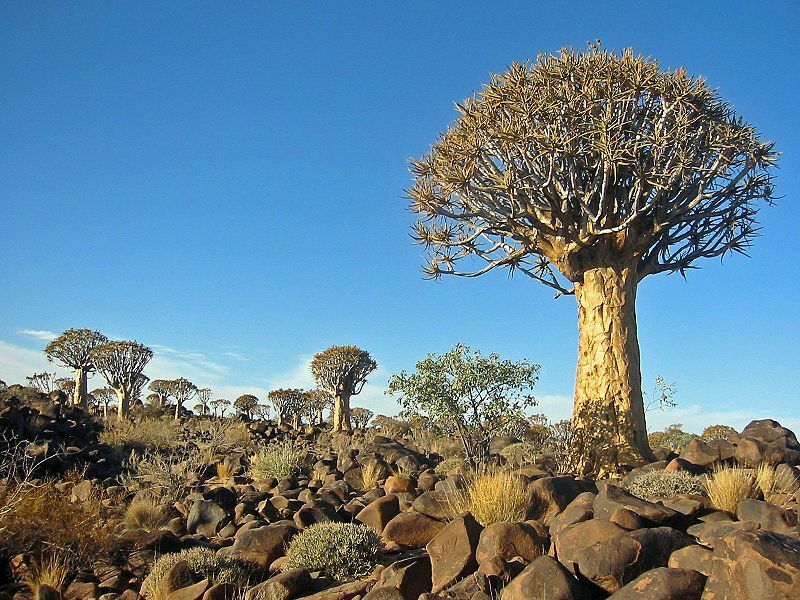 Reitz caught up with Smuts at Aus, 100 miles across the Namib Desert from Luderitzbucht. Smuts’ immediate objective was to prevent local German forces from retreating northward and reinforcing their comrades near Windhoek. But his army had arrived on the scene a little too late, and the enemy was already getting away along the rail line that created a thin corridor of habitation running up and down along the central plateau. Smuts had sent a detachment of 800 under Duncan McKenzie to try to forge ahead and cut the Germans off. The enemy had booby-trapped the country as they retreated. Wells had been poisoned and mines planted not only along the road and railway line, but at odd places among buildings. Devices were set to explode when a doorknob was turned or the wick of a kerosene lamp was lit. This was a form of warfare new to Reitz, and he thought it unreasonable. “As far as the wells were concerned we could not complain, for warning notices had been left, but to bury infernal machines in a place they had given up was new to us.”* He soon lost his beloved horse Bismarck when a mine exploded among an infantry company and spooked the horse so badly that it bolted off into the desert, never to return, when Reitz dismounted to help the wounded. Smuts sent Reitz off to find out how McKenzie’s detachment had fared. He was accompanied by James Leisk, a government official and “old acquaintance” of Reitz. This was a recurring theme: Reitz seemed to know half the white population of South Africa, partly because it was a thinly settled country where the same family names popped up again and again, and partly because he had a special gift for friendship. His conversation, full of humor and anecdote, served as a kind of social glue. He and Leisk, after four days of riding and shooting antelope for food, found McKenzie’s men at Gibeon Town. McKenzie had arrived just too late to cut off the Germans, but with a lunge at the rearguard managed to take 150 prisoners and capture substantial supplies. Now Reitz and a Colonel Muller were instructed to drive north in two “motor cars” to make contact with Botha’s army. They paralleled the rail line, forging through a dust-colored landscape that was inhospitable to start with—hostile sand dunes, blazing heat—whose inhospitable nature was compounded by manmade destruction—rail lines torn up, wells and water tanks blown to pieces. Between Marienthal and Rehoboth, water became the defining problem. Reitz and Muller grew terribly thirsty, and the radiators of their cars went bone dry. They were saved when they found a patch of tsama melons, which Reitz recognized as a water source, and extracted liquid by gently heating the fruit. Here Reitz drops out of the picture, as he did not participate in this conflict, having received orders to return to Smuts’ southern army. It remained for Botha to bring in more supplies from the coast and to make his final attack on troops that had retreated along the Otavi rail line to the north. Reitz’s old pal Coen Brits brought his men—now under the designation of the 1st and 2nd Mounted Brigades—all the way up to Etosha Pan and looped around to prevent a German retreat to the southeast. It is a bit difficult for us to imagine the nature of the terrain. 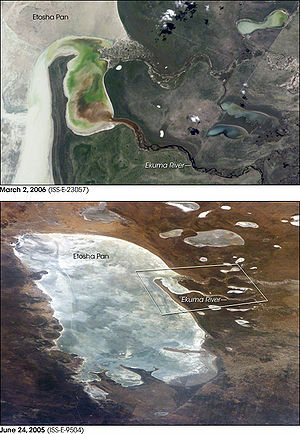 The pan is a vast area that remains entirely arid most of the year but seasonally acquires a thin veneer of mineral water that attracts wildlife. The Germans surrendered unconditionally July 9, 1915. It was the first permanent Allied victory of WWI and was cheered by British forces on the Western Front when they received the news. For a much more detailed account of the particular troop movements involved in this obscure chapter of World War One, please visit this article in the journal of the South African Military History Society. The territory remained in South African hands until 1990, when the South West Africa People’s Organization (SWAPO) won a long and grueling war of independence. Victor Franke remained in the territory until 1920 and spent some years afterwards in Brazil. According to one source, he suffered from an addiction to morphine. 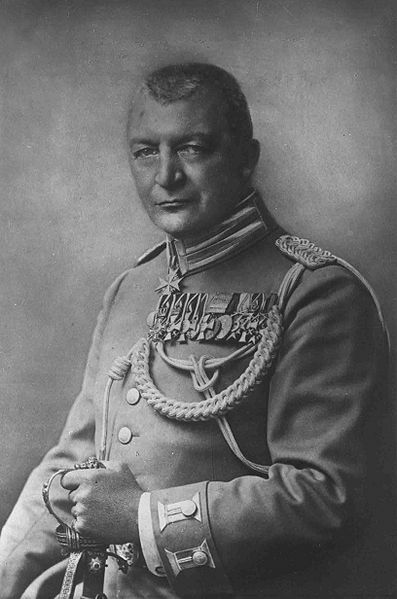 Unfortunately for him, his experience in Africa was much less successful than that of his better-known compatriot in “German East,” Paul Emil von Lettow-Vorbeck. We will turn to that campaign next. This is the fourth part of a series that starts here and alternates with other posts. Deneys Reitz was practicing law in Heilbron in the Free State, where nearly every citizen other than himself supported the rebellion. On the morning of October 23, 1914, a man came to his office to warn him that the district commandant, David van Coller, was coming that night to take the town on behalf of De Wet, and that Reitz was to be shot in his own back yard. Fortunately, Reitz had a very fast horse on which to escape. Think of a cowboy galloping along, glued to the saddle, but change the cowboy gear to a regular man’s suit and hat, and change the saddle and bridle from Western to English, and you’ll have the idea of a Boer on his horse. Reitz had grown up on horseback, jaunting off across the veld on long hunting expeditions with his brothers. He fought the Boer War on horseback as well, and grieved when one after another of his faithful companions (as he thought of them) died along the way, wounded or starving or dropping from disease. In Heilbron he had a horse named Bismarck, “one of the best in the country,”* and his African servant Ruiter had a fast Basuto pony—a tough, nimble breed that over the years 1899 to 1902 became the envy of the English. When Reitz explained to Ruiter that they would be going for a bit of a ride, Ruiter replied that “we had the legs of any animal in the district.” I quote the exact words because both the expression and the situation come out of a world that’s entirely extinct. Two other loyalists joined them at dusk, reporting that “all the countryside had risen, and mounted bands were patrolling in every direction.” They rode silently out of town, found a hollow to hide in, and the next morning peeked over a hill to discover 70 armed men doggedly waiting for Reitz to ride over a nearby railway crossing. From this point it becomes a good old-fashioned chase scene on horseback. Off down the highway—pursuers thundering behind—reach rail depot—mail train comes in—Reitz and his two friends jump on the train—Ruiter leads their three horses off to an agreed meeting point. Two themes come into play that will be familiar to readers of Commando. One of the themes is that of “blossoming into field rank”—first Reitz learns that his chief foe has suddenly become a general, but then he himself abruptly becomes a commandant. The other is that Reitz continues with his lifelong record of ridiculously good luck. He not only escapes unscathed, but his band of followers magically grows from two to thirty to two hundred and fifty. Incredible, but all true. Reitz and his newly formed commando next join forces with a well-known figure named Coen Brits, famous for maintaining his military competence while completely pickled in alcohol. Their assignment from Louis Botha is to chase down Christiaan De Wet, who is up to his old tricks, roaming the central Free State with a band of 5000 troublemaking men. Botha has exchanged his prime minister’s hat for his general’s one and is personally leading his army into combat, a circumstance of course utterly impossible in today’s world. The rebels have altogether about 12,000 men, but the loyalists number 32,000, of whom fully 20,000 are Boers who no longer subscribe to hatred of the British. When Botha arrives in the northern Free State with a good chunk of these men, Reitz and his followers split off from Coen Brits to join Botha’s army, and they corner a body of rebels at a bend of the flooded Wilge River. By early December the rebels are done in. Maritz is defeated by Jacob van Deventer at Upington and escapes into “German West.” (He lives until 1940 and becomes an ardent supporter of Hitler.) Beyers drowns in the Vaal River while attempting to elude government forces, while the remains of his followers join forces with Kemp. 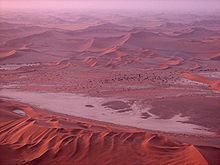 The men with Kemp then trek across the Kalahari Desert in an attempt to join Maritz in German West, but many die of thirst. Some of the survivors of the Upington battle, and some of Kemp’s men, are involved in an abortive attack with German forces on the innocent little South African town of Kakamas—it is the only German invasion of a British Commonwealth town in all of WWI. Most eventually return to surrender. Sad is the story of what happens to De Wet. Reitz described it best: Coen Brits had captured De Wet. He had collected a number of motor cars, and with these wore down De Wet’s horses, until they could go no further. When I heard how the obstinate old guerilla leader had been run to earth by the help of mechanical contrivances, I was almost sorry, for it spelt the end of our picturesque South African commando system . . . it would no longer be possible for mounted men to play hide-and-seek across the veld, and the good old days were gone for ever. Botha was forgiving toward the rebels and let most of them simply go home. Some of the leaders received fines or short terms of imprisonment. De Wet was jailed but soon released to his farm on parole. Now, it was time to invade German West. Posted by Jenny in Boer War, World War One. Jan Kemp, unknown rebel, Manie Maritz at Keetmanshoop in "German West"
This is the third part of a series that starts here and alternates with other posts. Men on horseback, rifles ready, seen against the skyline. 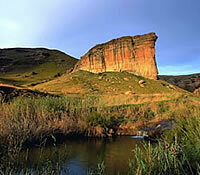 Vast slants of veld, faint tracks that cross the pass and angle down to ford the river. Railroad lines torn up by saboteurs. We could easily be talking about the Boer War, but it is 1914, and this is the Maritz Rebellion. Twelve years have passed since the Treaty of Vereeniging—a strange and vicious war is raging, far away in Europe—old Boer stalwarts sniff an opportunity. Any setback for “the English” just had to be good news, especially if it came at the hands of Germany, who’d supplied arms and volunteers to help them in the 1899-1902 war. 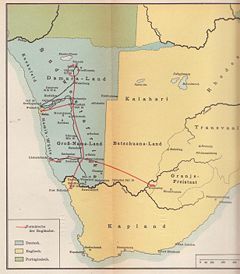 Soon after declaring war on Germany, the British government asked Prime Minister Louis Botha if the Union of South Africa would be willing to invade its German neighbor, South West Africa (now Namibia)—sometimes called “German West” to distinguish it from “German East” (now Tanzania). Botha said yes. But the opposition party protested. They feared this might be unwise: if Germany won the war in Europe, things could go hard for South Africa. That was the argument, anyway. The real objection was that fighting on behalf of England seemed an utter travesty. 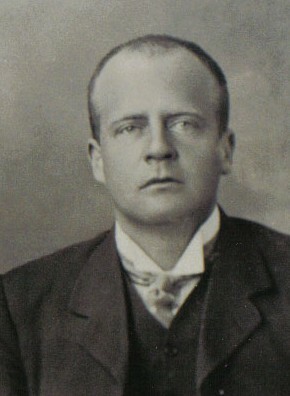 Nevertheless, Botha had enough support among citizens of English descent and mainly Transvaalers (not Free Staters) that the plan was voted through in parliament. General Christiaan Beyers, commander-in-chief of South African forces, promptly resigned. But Jan Smuts, who held the post of defense minister at the time, ordered troops to the border. As it happened, the man in charge of forces closest to “German West” was Manie Maritz. Maritz was notorious. Reitz had known him since the days both had fought under Smuts in the western Cape. His extreme physical strength, his sentimentality, and his short temper made the subject of many anecdotes. 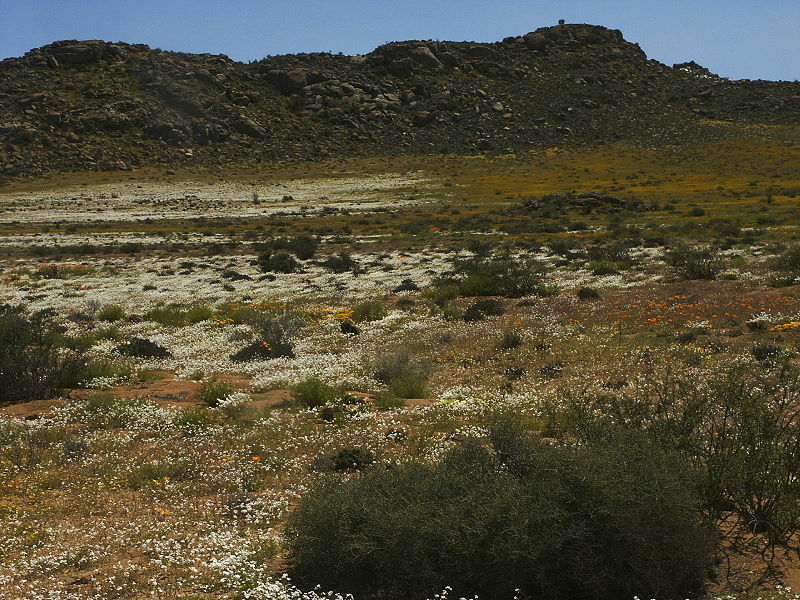 In March 1902, at the mission station of Leliefontein in the Namaqualand desert, Reitz and other members of Smuts’ staff had encountered the grisly remains of a massacre—20 or 30 dead Namaqualanders, killed (they soon learned) by Maritz and a few of his men. The “natives” had dared to side with the British, and Maritz had done his best to wipe them out. Oddly enough, Reitz had run into Maritz again in Madagascar. Several months after he settled there, Maritz arrived in a blare of publicity. A millionaire madman named Lebaudy had hired him to acquire land in Madagascar that was to become part of a new pan-African empire with Lebaudy on the throne. Maritz lost no time in spending Lebaudy’s money, throwing lavish parties for the white community, buying gramophones and motorcycles (both novelties on the island). Maritz left Madagascar at nearly the same time Reitz did—Lebaudy had inconveniently stopped wiring funds—and put in some time adding to his hyper-racist resume by helping the Germans in “German West” in their campaign to eradicate the Hereros. It was an especially brutal program even by the standards of colonial African history. So now Maritz had a commando of 1000 men at a place called Van Rooyensvlei, little more than a well on the bank of a dry riverbed, 24 miles west of Upington in what is now the northern Cape. On October 9, with armed German troops arranged carefully in the background, he gathered his men and told them to choose between allying with the Germans or going into a German prison camp. The Germans had promised to aid them in realizing “the long-cherished ideal of a Free and Independent South Africa,” Maritz assured the gathering. Reitz’s brother Joubert was among those who opted for prison. Other Boer leaders were riding hither and thither across the country, busily gathering rebel forces. They were going to fight their own government! A government that had, in their view, sadly lost sight of all the old ideals. On October 14, Botha declared martial law. Support for the rebellion was especially strong in the Free State, where the population remained fiercely loyal to the war hero Christiaan De Wet. The main rebel leaders were De Wet, Maritz, Beyers, and Kemp—all famous from the war against England. Reitz was practicing law in Heilbron in the Free State, where nearly every citizen other than himself supported the rebellion.